Injury updates for the Los Angeles Dodgers as of May 21, 2018. 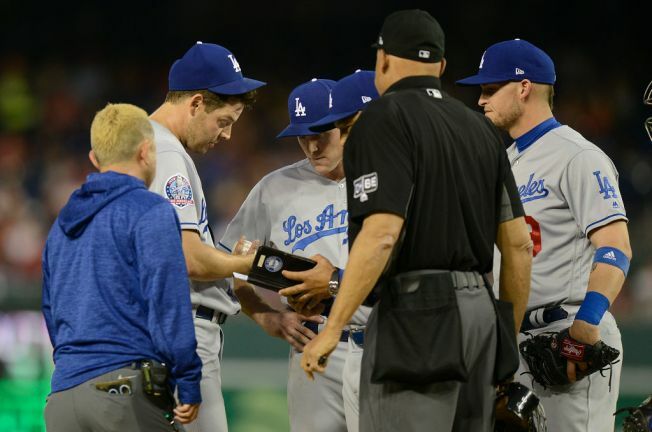 The injury bug bites all teams from time-to-time, but the Los Angeles Dodgers seem to always be the main course. The Dodgers set the record for the most players on the disabled list in 2016, and backed it up with an MLB-high 38 total DL stints in 2017. That trend has continued in 2018 as the Dodgers have already placed eleven different players on the DL in the first six weeks of the season. As of today's date, injuries have made eleven different players miss a total of 288 days on the DL. The biggest blow of course was the announcement on April 30 that two-time All-Star shortstop and 2016 National League Rookie of the Year Award winner, Corey Seager, would miss the rest of the season with a strained UCL in his right elbow and underwent Tommy John surgery. Days later, the Dodgers were dealt another huge blow as three-time Cy Young Award winner and 2014 National League MVP Clayton Kershaw went on the DL with bicep tendinitis. However, as is often the case in the ebbs and flows of a MLB season, the Dodgers received some good news last week as Yasiel Puig, Justin Turner, and Logan Forsythe all returned from the DL to provide the team with reinforcements and a much needed boost. Clayton Kershaw (bicep tendintis): Kershaw has been on the disabled list since May 6, and has missed a total of 16 days so far. An MRI with Dr. Neal El Attrache brought with hit good news that his injury was tendinitis and nothing worse. Kershaw has continued to play catch since going on the DL and Dodgers' manager Dave Roberts announced on Monday that will throw a bullpen session on Wednesday and a simulated game on Saturday. If all goes well, he could feasibly return to the rotation, but the team might opt for him to make one rehab start first. Rich Hill (Finger): Hill is the latest to return to the disabled list after an earlier stint on the DL in April with a cracked finger. This time, Hill heads to the DL with the same nagging injury that has plagued his last few big league seasons: blisters. As a curveball pitcher, Hill is no stranger to dealing with a blister on his left middle finger, but on Saturday night in Washington D.C. the skin ripped completely off after making just two pitches. The team believes Hill's stint on the DL this time could be more like his 38-day stint back in the summer of 2016. Tom Koehler (Shoulder): Originally believed to be a bicep injury, Koehler was diagnosed with an anterior capsule strain early in spring training and was placed on the 60-day disabled list to start the season. Koehler has began playing catch from a distance and could go on a throwing program soon. His return is still a ways away as he will need to ramp back up his arm strength and make a string of rehab assignments despite being eligible to come off the DL on Sunday. Corey Seager (Elbow): The biggest blow of all for the boys in blue was announced on Monday, April 30 when the team reported that Seager was diagnosed with a right UCL sprain in his throwing elbow and have to undergo season-ending Tommy John surgery. Seager's surgery took place in Los Angeles on Friday, May 4, performed by Dr. Neal El Atrtache. El Attrache told the team that the surgery was a "success," and Dodgers manager Dave Roberts said that Seager would rehab at home in North Carolina for the remainder of the season. Hyun-Jin Ryu (Groin): Ryu is the most recent of devastating injuries to befell the boys in blue. The Korean pitcher left his start against the Arizona Diamondbacks in the second inning on Wednesday May 2, with a groin injury. An MRI revealed that it was a grade 2 strain and Dodgers manager Dave Roberts described the injury in graphic detail saying that the "muscle tore off the bone," and that Ryu would be out until well after the All-Star break. Dodgers Injury Updates are provided each and every week, usually on Friday or Sunday throughout the season.